WonderFlex PU is a unique single component polyurethane liquid membrane. It cures rapidly to form a completely defect free and bubble free membrane with excellent mechanical and elastomeric properties. This product is ideal for use during the winter months or in climates with relatively low humidity. Furthermore, the fact that the minimum consumption can now be achieved in only one coat, reduces labour cost. Not recommended for: • Unsound substrates, • waterproofing of swimming pool surfaces in contact with chemically treated water. Bubble and defect free membrane. Excellent thermal resistance, the product never turns soft. Moisture vapour transmission: The film breathes so there is no accumulation of humidity under the coat. APPLICATION PROCEDURE: Clean the surface using a high pressure washer, if possible. Remove oil, grease and wax contaminants. Cement laitance, loose particles, mould release agents, cured membranes must be removed. Fill surface irregularities with the necessary product – WonderFlex PU sealant and/or WonderFlex Fibered solution. PRIMING: Apply the required primer following the guidelines above. Primer usage is necessary. APPLICATION: Apply the material with roller or brush in one or two, coats. 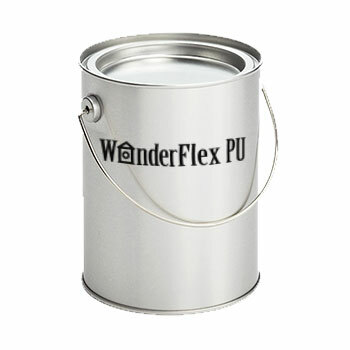 CONSUMPTION: WonderFlex PU liquid membrane – 1,5-1,6 kg/m2. For consumption of primers, sealant and fibered solution please see instruction. PACKAGING: 2kg, 6kg, 15kg, 25kg drums. SHELF LIFE: Can be kept for minimum 12 months in the original unopened pails in dry places and at temperatures of 5-25C. Once a pail has been opened, use as soon as possible.